With the mountain forecast suggesting improved visibility towards the afternoon, In-Law and I elected to hit drop-off at a civilised 10 am. 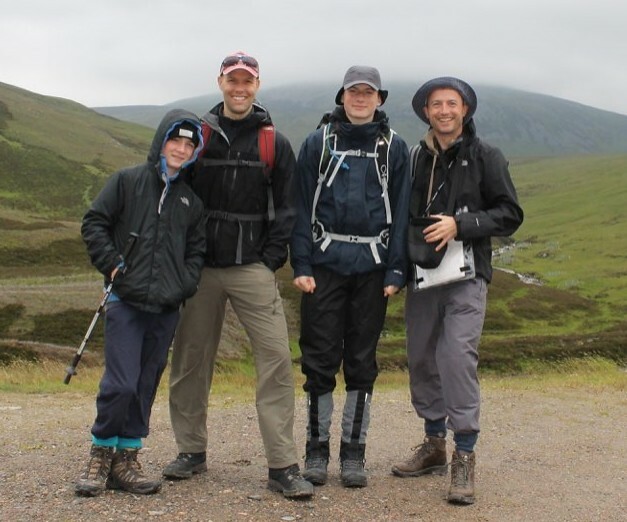 We had, however, under-estimated the journey time and, despite the impressive new sections of the Perth-Braemar road, we didn’t start walking till around 10:30 am. 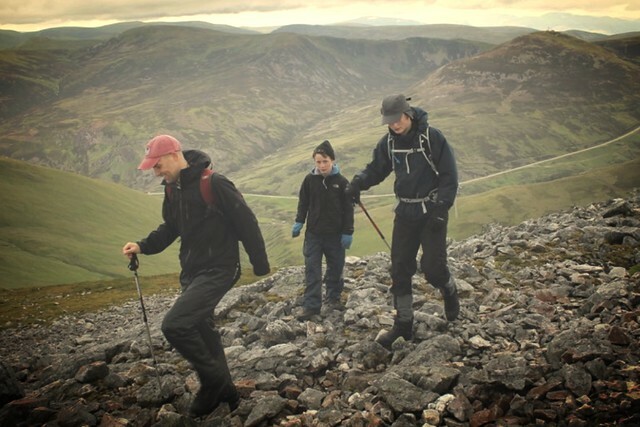 Happily my anecdotes of school Glenshee ski trips and anarchic over-taking coaches in the 1980s meant that our party of 4 were raring to get out of the car. Our first task was to hide my mother’s 3 speed, 25 year old ‘Lady’s bike’ at the end point (the car park below Creag Leacach 987m). Anyway, at around 10:40am, we set off on foot under grey skies towards the mist-shrouded Carn-an-Tuic. The gently sloping path follows the North bank of the burn with its impressive waterfalls for around 1.5 km. In good spirits we hit the steeper ground and headed up the North West slopes into the clouds. The mist became increasingly wet as we ascended and we deployed waterproofs at around 11:30am. There was some disagreement among the squad as to whether what we were experiencing was, in fact, rain. Fortunately, I was able to allay fears and prove that, due to the lack of splashing in the puddles, this still qualified as mist. In-Law made some irrelevant points about this being due to the ‘driving' and 'horizontal’ quality of the mist. In any case, we walked on, fuelled with a hefty intake of strong black coffee. With the path now lost in mist and scree, we followed the compass and an innate sense of ‘up’. 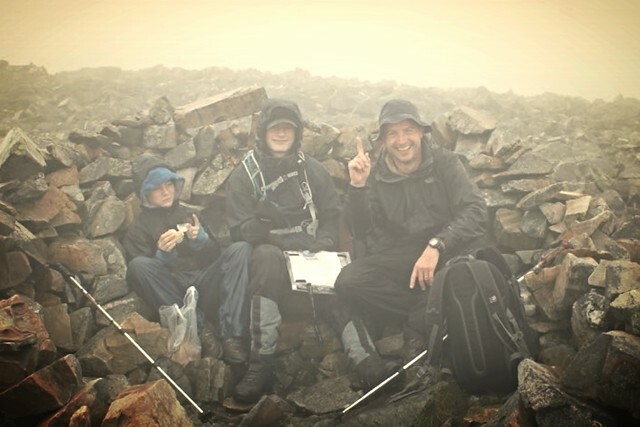 There was a small degree of insubordination from older son about the safety of the route, but, happily, the scree soon levelled out and, there, at around 12:30hrs, looming out of the mist, was the cairn marking the summit of Carn-an-Tuic (Hill of The Wild Boar) 1019m. We huddled in the stone shelter and ate the first of our disappointingly bland humus and salad rolls. The wind was quite strong – around 30-40 mph and we soon wanted to move on. The cloud occasionally opened up and gave us tantalising glimpses of the view we couldn’t see. We set the compass and headed off South-Easterly towards Cairn of Claise. There was a dramatic moment as we started to break beneath the cloud level and watched great swathes of mist racing up the corries of the Cul Riabach beneath us to the South. Soon we made out the path to the South leading back up into the mist and we reached the next summit - Cairn of Claise 1064m - at 13.20hrs. 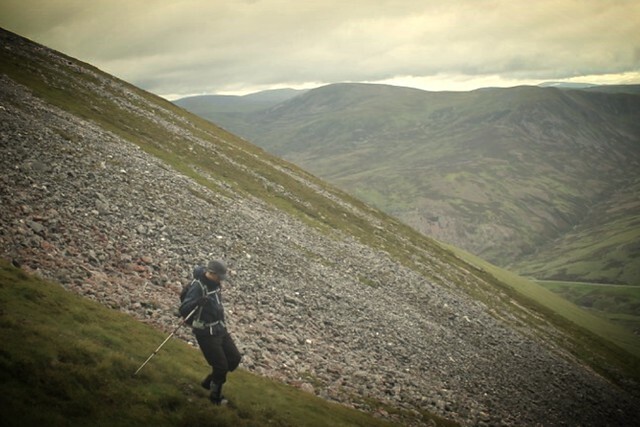 We considered heading East at this point to knock off Tolmount and Tom Buidhe, but, given the extensive mist and the heavily swollen bog on the route, we elected to head on to Glas Maol. The cloud was definitely starting to lift now and we had a couple of prolonged periods of clarity. We met our first walker at this point going the other way. He pointed out a huge herd of deer down in the Garbh Corrie below. There were also some large snow patches above the cliffs of Caenlochan Glen, but sadly the mist descended before I could get my camera out. We were deceived for a while by a good path going the wrong way, so we decided to head up the scree to our right and soon made out the same cairn/stone-shelter combo of last two summits. 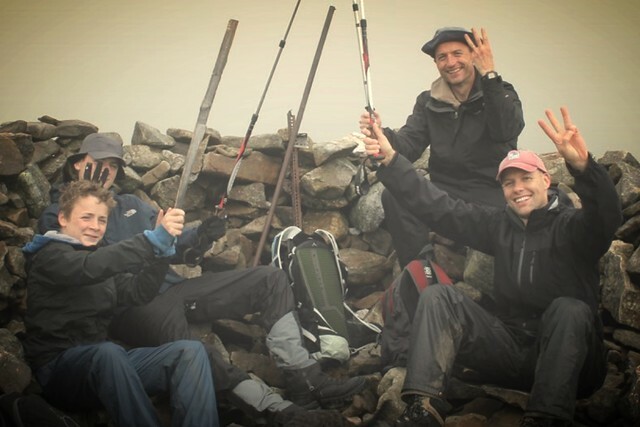 It was 15:00 and the Glas Maol summit at 1068m meant we had completed our third Munro. Our sense of masculine achievement was only slightly dampened here by encountering a lady walking her labradoodle puppy. 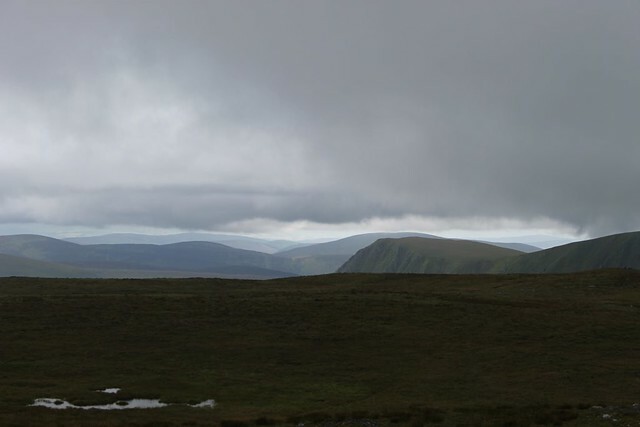 We headed down the Southern slope of Glas Maol and dropped below the mist again. We could clearly make out the dramatic ridge leading up to Creag Leacach. The ridge is around 10m across and drops away sharply for about 200m on either side. An easy stroll on a clear summer's afternoon, but it must be pretty interesting in winter. 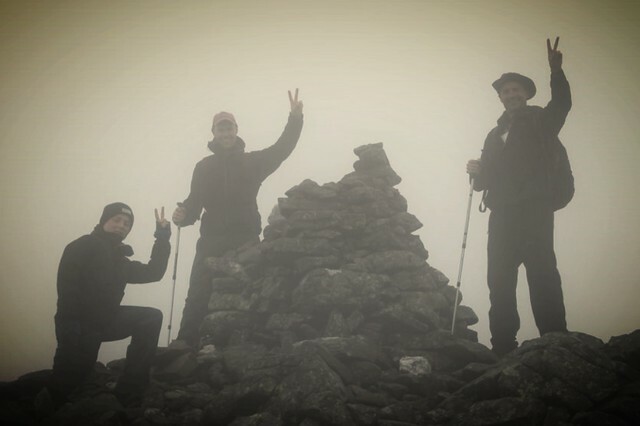 At 16:10 we summited Creag Leacach 987m and enjoyed our first cloud free top. With clear visibility all the way back to the lay-by, I handed the reins of power to In-Law who picked a cunning route down the steep corries beneath Leacach. On the way down we disturbed a pair of ptarmigan and Son 2 spotted two herds of deer, one of which must have numbered over 100. We had also seen around 20 mountain hares, copious grouse and 1 frog during the walk. Viewed from the descent, the shocking steepness of my imminent cycle ride was laughably clear. We decided that Son 2 and I would attempt to hitch instead. 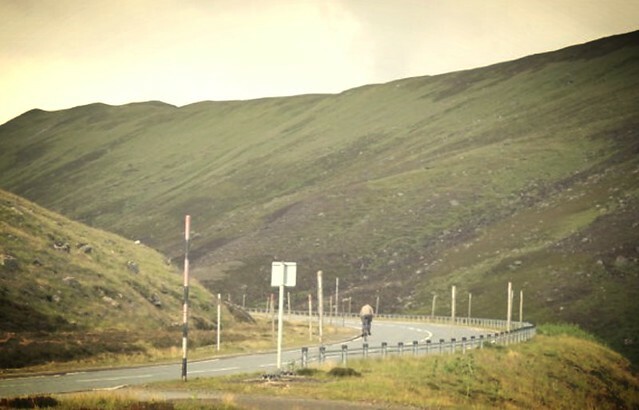 Sadly, not a single car out of around 20 considered stopping for two obvious hikers in distress and, so it was, that, at around 17:50, I mounted my mother's rusty 'three speed' and headed off up the road to Glenshee. It wasn't too bad and I enjoyed the awed expressions on various lycra-clad cyclistas who clearly supposed I'd ridden all the way from Perth. Once I'd got through the ski area, I had a thrilling schuss down to the car. Now all our 4 peaks were bathed in glorious late afternoon sunshine and the bike ride was the final triumph of what had been a fantastic day. Only 275 Munros to go.